MESSAGE TO MEDIA: IT’S THE ASSIGNMENT OF MORTGAGES NOT THE AFFIDAVITS! Just a friendly reminder to you that you’re still missing the target by a looooooooong shot. In order for anyone to have standing to foreclose in the first place one needs to perfect the chain of title. An assignment of mortgage is the document which indicates that a mortgage has been transferred from the original lender or borrower to a third party. Assignments of mortgage are more commonly seen when lenders sell mortgages to other lenders. When someone has what is known as an assumable mortgage, it is possible for the borrower to transfer the mortgage to another person, in which case an assignment of mortgage will need to be filed to record the transaction. Before anyone can produce any affidavits period…they first must have equitable rights transferred! Our MEDIA BLACKOUT! 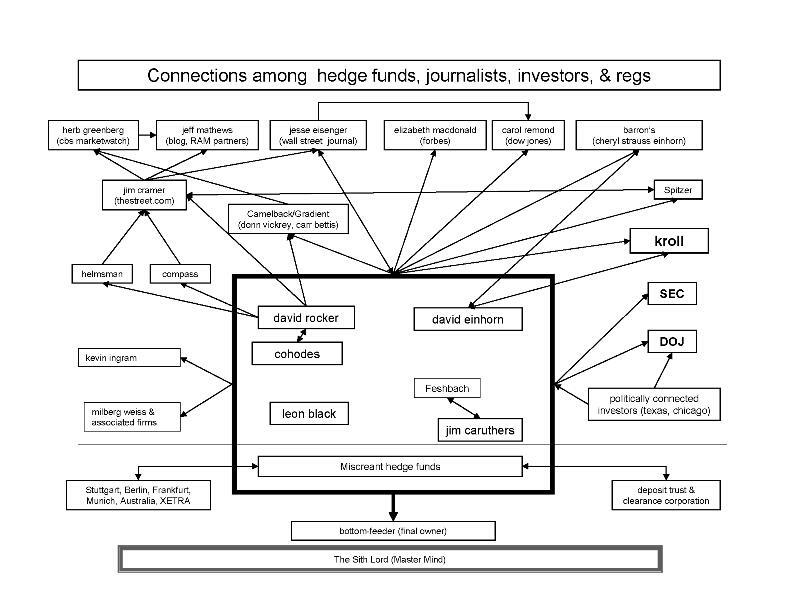 Six degrees of (Wall Street) Separation. I soon found myself addicted to Mr. Byrne’s site. Bottom line is you can’t bite the hand that feeds you or else. I read many articles that describe the Media as being afraid that if they dare put ANY negative information out there, they themselves will be left in the dark, hungry, unemployed and foreclosed on…wait that is many of us. You understand they risk on not getting any funding to stay alive since they depend on the loans provided by these Wall Street banks in order to survive. SHUT DOWN. I then began to search any media that portrayed the ugly side of the Banksters. I located The HUFFINGTON POST (Arianna Huffington a simple woman with a lot of voice behind her greek accent), as does Bloomberg and once in a while Vanity Fair for their explosive articles on Wall Street. The bloggers I usually follow in my blog are some I enjoy for their tremendous input…usually any insider information comes through them days before the media even gets to expose it. Perhaps they need approval. So I hope this answers many of you why the media has not picked up on this. You will have to email highly respected Bloggers and post yourself on these sites to get the word out. Don’t depend on any of the Major networks to put this information out. When they seek an interview, they’ll only seek to discredit you.